I thought I would share my yesterday I spent with my baby sister Melissa. We have a lot in common and I love this. I love that we can call it a "girls day" and not do anything girly and be completely ok with it. Our day consisted of first driving around trying to figure out where we wanted to grab a bite to eat. This becomes a tad limited when it comes to Sundays in Centerville. So we opted for IHOP, a sure-to-be-open-on-Sunday option. There I finally had some waffles, to which I have been craving forever. Not that they are the greatest, but it satisfied my craving. 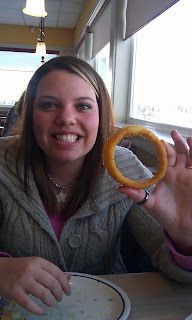 Melissa opted for a breakfast sandwich with onion rings. Not exactly the most common combination, but who's to judge? After we ate our satisfying meal, we ventured over to the new Centerville movie theater. This place is fancy. The whole lobby is a giant circle with a cafeteria-like eating area in the center. And a super fancy soda dispenser that is all computerized and let's you choose from 100+ drinks from this one machine (or so it says). Anyway we went to this futuristic theater to see Sherlock Holmes. The movie was pretty good (a little too much slow motion for me), but otherwise a fun movie. Once the movie was over we then proceeded to go back to my house and play video games. We played a very little bit of Call of Duty, Melissa taught me how to better kill zombies, so I'm excited to try now. I was really sucking it up before. We then proceeded to play a little Super Mario Sunshine (I love how the Wii also works as a Gamecube), and then we moved on to some Super Mario Galaxy. We're Mario fans in this family. Once we were all video-gamed-out, I took her home and then went back home to watch more Firefly. All in all it was a pretty good Sunday, and I again have to say how I love that I can spend time with my sister and it doesn't have to be girly, not that we don't love to do that from time to time as well. I saw that theatre last time I was out there. It's pretty fancy!